GF/DF Brownies? Oh yes I can! A while ago, DH and I were having a party and I wanted to have a chocolate dessert on the menu. I figured that brownies would be perfect, but the challenge was finding a recipe that was gluten free and not completely unhealthy. A little unhealthiness in a brownie is fine, however, and my search came across this recipe (also posted below for convenience) for Gluten and Dairy Free Black Bean Brownies over at My Darling Lemon Thyme. I use rice bran oil, but any neutral tasting vegetable oil will do. Soft brown sugar can be used in place of muscovado if you prefer and remember to make sure your baking powder is gluten-free, as some aren’t. I use Whittaker’s 50% dark block which is dairy-free. If using dried beans, drain soaked beans and cover with fresh water. Bring to the boil then reduce and simmer for about 1 hour until very soft, but still holding their shape. Drain and set aside to cool. Preheat oven to 180 C/350 F. Grease a 18x28cm slice tin (rimmed) and line with baking paper. Tip cooled beans into the bowl of a food processor and blend to form a smooth paste. Add the eggs and oil and pulse to combine. Add sugar, cocoa, almond meal, vanilla and baking powder. Process until smooth and well combined. Add chopped chocolate and pulse to evenly distribute. Spoon mixture into prepared slice tin and smooth the top off with the back of a spoon. Bake for 30-35 minutes or until a inserted skewer comes out clean. Cool in the tin. Slice into 12 squares and serve. Store leftovers in an airtight container for 3-4 days (that’s a guess as ours only made it to the second day!). It will firm up and go more fudgey if stored in the fridge. The first time I made these, I baked them in an 8″x 8″ pan. 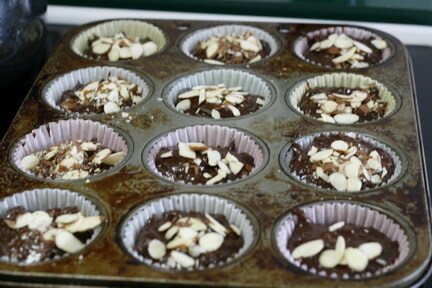 This week, I decided to make my life easy and baked them in the muffin pan. Since the recipe makes 12 brownies in a pan, 12 muffins it was. A couple for now, some for the fridge and the rest for the freezer for lunches. All in all, they turned out very well and I highly recommend making them! Another bonus of this recipe is that the measurements aren’t just by volume, but by WEIGHT! I can’t emphasize enough how important that is with gluten-free baking. Recipes come out much better and more reliably when things are by weight. This entry was posted in Baking, Dairy Free, Gluten Free, Musings, Personal, Random Thoughts and tagged black bean brownies, gluten dairy free black bean brownies, mydarlinglemonthyme.com. Bookmark the permalink. 4 Responses to GF/DF Brownies? Oh yes I can! The beans are an interesting addition and they look delicious. The brownies have a very dense yet crumbly texture. They are also really fudgey, and a quick zap in the microwave melts the chocolate nicely.